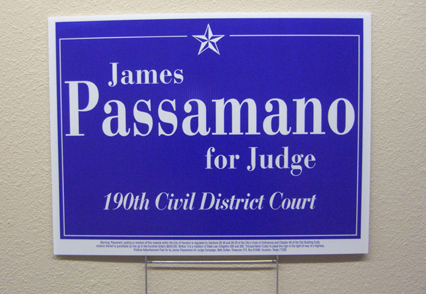 Political Signs are made fast at Signquick. Running for political election? Regardless if this is your very first campaign or you are an experienced political campaigner, our team at Signquick can easily help. We have decades of printing expertise, much of it on political campaign yard signs and political election promotion items, we feel qualified to meet your election campaign needs. Our expertise begins with narrowing your selections on selection of sign materials, sign size, and sign quantity to reflect your image and in trying to keep with your campaign budget. Design Gallery - offers sign templates and layout ideas. Font Gallery - provides suggestions on type style. Many different others are available. We are the producer right here in the United States. Your political order is critically followed throughout the design and manufacturing steps to insure quality and timely shipment for your campaign. We have exactly what you need for your political campaigns!